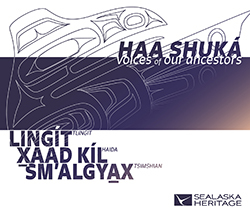 Sealaska Heritage Institute (SHI) has opened the application period for its Haa Shuká Community Language Learning Project, a new program designed to help revitalize the languages of the Tlingit, Haida and Tsimshian in four Southeast Alaska communities. Applications will be accepted through Feb. 10, 2017. Funded by a grant from the Administration for Native Americans, the program builds on SHI’s previous Tlingit language mentor-apprentice program, which ended in December 2016. “We learned a great deal from our Tlingit language mentor-apprentice program that we will incorporate into this expanded effort that will include Haida and Tsimshian as well as Tlingit,” said SHI President Rosita Worl. The new project will pair fluent speakers of Lingít (Tlingit), Xaad Kíl (Haida) and Sm’algyax (Tsimshian) with intermediate and advanced speakers in those languages to increase learner proficiency. Language learning teams, made up of one mentor and two apprentices, will meet weekly to immerse themselves in their respective languages over the course of three years. Language learners will also enroll in language courses through the University of Alaska Southeast (enrollment will be paid by SHI) and work independently on transcriptions of language recordings and documents to build their fluency. Participating communities are Metlakatla, Hydaburg, Sitka and Juneau. To be eligible to participate, an applicant must be an Alaska Native as defined as “Native” under the Alaska Native Settlement Act, 443 U.S.C.A. 1602(b), or enrolled to Sealaska or a descendant of an Alaska Native enrolled to Sealaska. Metlakatla applicants must be enrolled tribal members of the Metlakatla Indian Community. Applicants for language learners will be asked to substantiate their ongoing commitment as a language learner through past activities such as completion of a language class or workshop or dedicated work with a speaker. This project is not for individuals who have no prior knowledge of a heritage language. As part of this project, SHI has established a Southeast Regional Language Committee to provide guidance for the language teams and to help integrate the project with existing initiatives across the region. The committee is made up of heritage language speakers and advocates Lance Twitchell (Lingít), Ben Young (Xaad Kíl), and Gavin Hudson (Sm’algyax). In order to encourage broad involvement, SHI will also work with the committee and regional groups to organize monthly language events and biannual immersion retreats in each partner community that will be open to the public. Project partners include the Sitka Tribe of Alaska, the Haayk Foundation, and Hydaburg City School District. SHI’s Haa Shuká Community Language Learning Project is the most recent in a series of initiatives that SHI has implemented since the late 1990s to help document, preserve and revitalize Southeast Alaska Native languages. Though significant progress has been made in that time, most fluent speakers are elderly, and the need for projects such as this one remains urgent, Worl said. Applications for the Haa Shuká Community Language Learning Project are available online at tinyurl.com/HaaShuka. For more information, contact project coordinator Jill Meserve at Jill.Meserve@sealaska.com.